Travel is so important to so many people. Traveling to new places lets us get away from the mundanity of our lives in order to see new things, experience different cultures, taste foods we’ve never had before, and visit iconic monuments or attractions that we’ve always wanted to see. Travel should be enjoyed by all, regardless of age or wealth, and if you happen to be a younger traveler or someone planning a trip on a budget, hostel accommodation is a great way to go. Hostels are usually the cheapest form of urban accommodation, but many of them offer all the cleanliness, comfort, and amenities of good quality hotels, including free breakfasts, organized activities, and cozy beds. Rome is one of the most beautiful and historic cities in the world. It’s a lively city, blending the modern and the ancient together and offering a huge list of attractions for everyone to enjoy. If you visit Rome, you’re guaranteed to spend a whole lot of time outdoors at the various monuments, galleries, attractions, and landmarks, so you don’t necessarily need to spend too much on accommodation. Rome is a great place for young people and solo travelers to stay in hostels, with lots of excellent hostel locations all around the city providing comfortable beds and convenient amenities to make your stay as enjoyable as possible. If you’re a solo traveler heading to Rome or simply someone looking to enjoy the benefits of hostel accommodation in the Italian capital, you have a lot of options to choose from. Rome is blessed with a lot of very highly-rated hostels, each offering its own unique features, room styles, and amenities. Many of them provide free services too like breakfast, Wi-Fi access, and bike rentals. 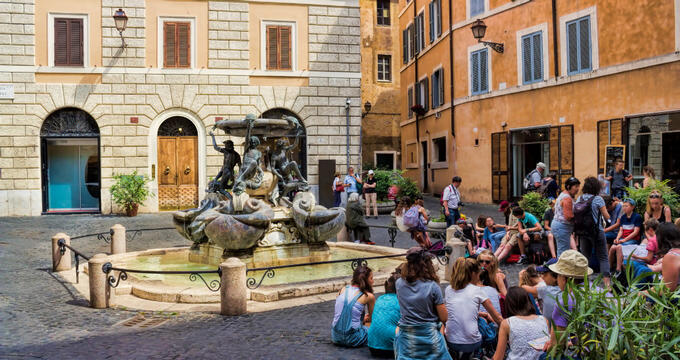 Read on to learn all about the very best hostels in Rome. Conveniently located right by one of Rome's most beautiful man-made landmarks, the Santa Maria Maggiore Basilica, this Rome hostel is also perfectly located just a short walk from the closest metro station and only a little over ten minutes away from the Colosseum. Small, mixed-gender dorms are housed in this Rome hostel at affordable rates, with each dorm sleeping between four and six people in bunk beds. Lockers and personal lamps are provided for every guest, along with high speed internet access. Due to the age of the building and history behind it, some of the rooms even have unique features like stone walls and wooden beams across the ceiling, which really gives this place an authentic, historical feel. A lounge, game space, bar, outdoor terrace, and equipped kitchen are all open for guest use. Quite possibly the best rated hostel location in all of Rome, Free Hostels Roma has received countless rave reviews for the friendliness of the staff and the cleanliness and comfort of the rooms. The rooms at this location are especially nicely decorated with comfortable beds arranged in a smart way to give everyone a little privacy, as well as brightly colored lockers and accessories. Both dorms and private rooms can be booked at this location and a buffet breakfast is included in the room rate. All rooms also come with private bathrooms, and the location is perfect for plenty of Rome's biggest attractions. What's more, you can also get free shuttles directly to Rome's Ciampino Airport from this location. Housed in an old building that dates back to the 1800s, Generator Rome is part of the hugely popular and well-rated Generator chain of European hostels, which can be found in many other major cities like London and Paris. The Rome location is in keeping with the brand's excellent reputation, offering modern decor, great service, and a lot of excellent amenities. Generator Rome is just a few minutes from the closest public transport links, and it takes less than 20 minutes to get from this location to some of Rome's most popular landmarks like the Colosseum. Both single-gender and mixed dorms feature at this location with shared bathrooms and secure storage locker facilities, or you can book a private room with more colorful decor and added furnishings if you're looking for a little more substance and privacy. Full breakfast is provided, with a restaurant and bar on-site, as well as a laundry room and cozy living room area for guests to mingle and relax.